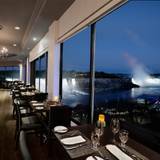 Spacious enough to host events for up to 125 guests, the Salon is located adjacent to Prime Steakhouse Niagara Falls, and showcases a view of Niagara Falls that is unparalleled. The flexibility of the Rainbow Salon makes it a great meeting room, or the ideal location for banquets and receptions. Please fill in your information below and Sales Team will contact you as soon as possible to book your event. If you’d prefer to talk now, please call us at (866) 374-4408.